If you are purchasing a certificate, this certificate request file “c:\*****.csr” now needs to be sent to the correct Certificate authority so they can generate a certificate with it. You will need to request a Unified Communication Certificate. Once the certificate is back from the authority, skip to step 6. 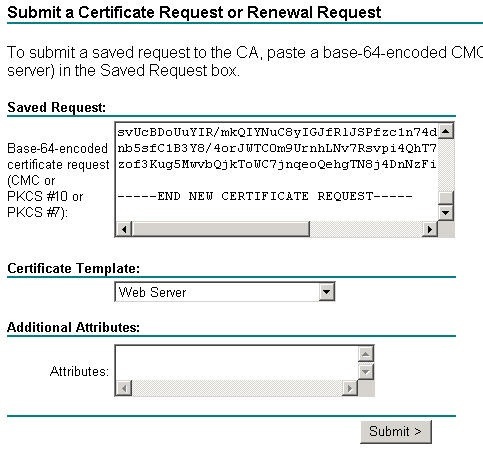 Request a certificate, submit an advanced certificate request, Submit a certificate request by using a base-64-encoded CMC or PKCS #10 file, or submit a renewal request by using a base-64-encoded PKCS #7 file. Next, run the following command on the exchange CAS – Get-ExchangeCertificate -DomainName "autodiscover.externalname.com"
(You don’t need to do this when you create the AutoDiscover certificate, only the mail.externalname.com certificate). Confirm the thumb print is the same as Step 6, then run – Enable-ExchangeCertificate -thumbprint 5FBE1CE1B31FD9C43E90D6133F85CF291D5A053E -services "SMTP, IMAP, POP, IIS"
Repeat these steps 2-9 for mail.externalname.com (OWA & Active Sync), including step 8. Open (local computer) Certificates in MMC on Exchange CAS, then in the personal certificates store, export the certificate you just created and export the private key. Right click on the certificate and choose export. Type in any password but don’t forget it, and save this somewhere which is accessible from your ISA 2006 Server, because you will need this to setup the listener. Open (local computer) Certificates in MMC on your ISA server, then in the personal certificates store import the certificate that you exported from step 11, you will need to enter the password. Then you should have a Valid certificate to use with ISA server.